The term wide plank hardwood flooring may seem odd and inexact but those may be just the qualities that are driving the huge rise in demand for wide planks that can range from 5 inches in width to 8 inches or more. The only thing uniform about true wide plank hardwood is the quality! After that, let your imagination be your guide and explore the vast possibilities. Wide plank hardwood floors have evolved into one of the most popular trends in the booming wood flooring industry and even locally in the Fort Worth metroplex. The quiet elegant charm of crafted wide plank floors fits perfectly into either a casual or formal environment. Builders, designers and architects are installing wide plank flooring into renovations, sprawling new homes or offices or into single room additions where old flooring meets new 21st century efficiency. 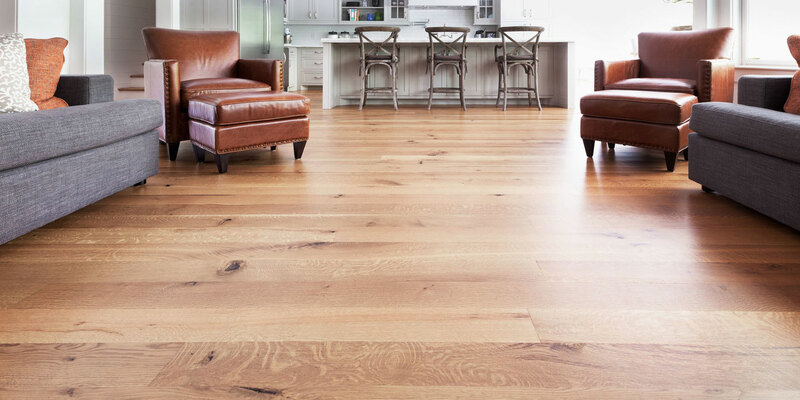 That Spacious Feeling – The straightforward elegance of wide plank floors has become a homeowner and designer favorite for a number of reasons, including the product’s ability to make every room look and feel larger than the dimensions. Today’s business owners and homeowners dread that crowded feeling and one way to open up a room or series of rooms is to install wide plank hardwood floors. Pick Your Wood – Wide plank flooring is available in most wood species, including hardwoods and softwoods. From rustic pine or oak wide planks to sophisticated walnut or exciting exotic woods like Brazilian cherry, finding the type wood is as easy as discovering your personal preference. While wide plank floors present many different choices, they never disappoint! Easy Customization – Once your wood type is selected, the homeowner or business owner can take customization to a whole new level. The boards can be cut to specific sizes or blended together in random sizes. Customize further by choosing from a wide range of colors, finishes and textures to achieve the precise look that best suits your need. With wide plank hardwood flooring, affordable luxury and elegance are just a few decisions away! Mixed Widths – One of the most exciting new innovations with wide plank flooring is the use of board groupings consisting of varying widths. Whether you prefer hardwood planks or softwood, the use of planks with mixed widths seems to more vividly accent the wood’s true and natural characteristics. The end result is a captivating floor that makes every element of the room feel more elegant. Hand-Scraped Wide Planks – Hand–scraped wide planks or wide boards capture the unique look of the wavy textures that result from hand-held chisels skimming along the wood’s grain. The striking appearance has captured the imagination of designers, builders and consumers and sets every hand-scraped wide plank floor apart. Distressed Wide Plank Hardwood Floors – There is something about the worn plank look that is irresistible. Homeowners are especially attracted to the uniqueness of every board and when they come together in a room, every dent, nail hole, gouge and ding adds to the authenticity of the planking. Spending time in a room with distressed wide plank flooring makes for an unforgettable experience! Flexibility – While it is always recommended that wide plank hardwood flooring belongs in environments that are dry and climate controlled, consumers can enjoy the look of wide plank hardwood flooring below grade or in damper areas by using durable, climate resistant laminate wide plank flooring. Laminate wide planks may not have the natural feel but the cost-effectiveness and adaptability of the flooring has led to huge demand, especially in commercial applications. Many wide plank floors use reclaimed lumber so there is a positive environmental impact when choosing these striking floors. They may be a bit more expensive than traditional solid hardwood floors but the return on investment and personal satisfaction can be a deciding factor. If you are considering flooring, be sure to check the possibilities wide plank hardwood flooring can bring to your home, office or addition.